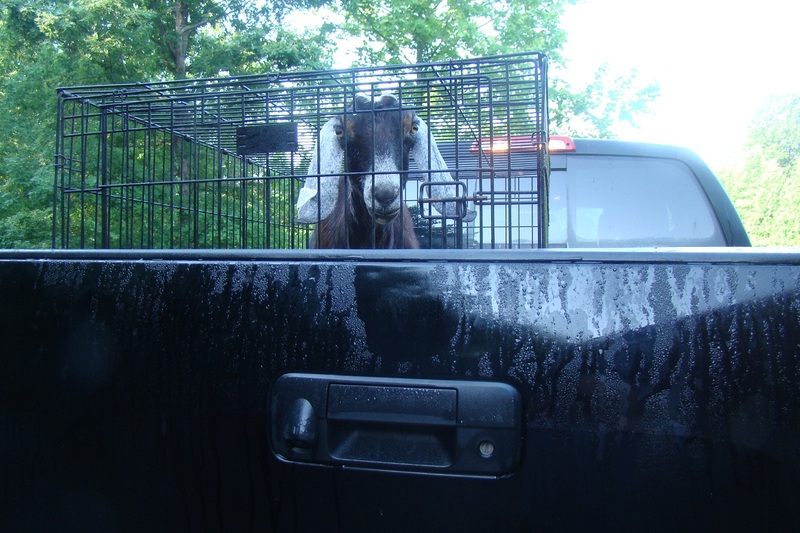 Goatlings from our farm usually go to new homes. We have five adult does and keep our own buck. We get milk from the moms when they kid and their babies are old enough to fend for themselves. When they’re a few months old, we start separating moms from babies overnight and milk the moms in the morning. Once they are fully weaned and fending for themselves at the grain feeder, the babies go to new homes and we milk the moms twice a day. This year, all of our baby goats went to new homes except for CoCo’s doeling. Isn’t she pretty? Her dad’s an alpine, CoCo’s an oberhasli. My husband was calling her ‘Lil C’ (little CoCo) and that eventually became Elsie. A proper name for a future milking goat, I must say! Humongous is how I’d describe some of this Spring’s lambs. Kat’s boys are just a few months old and are almost as big as she is. 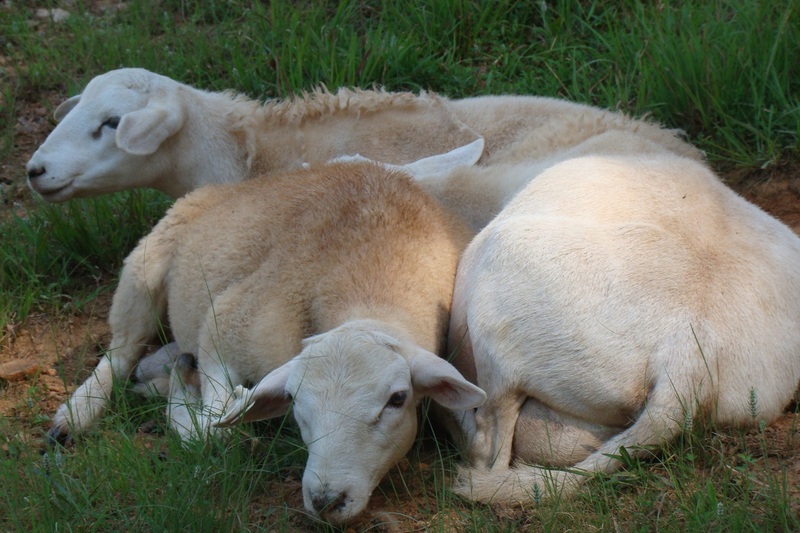 They are a tight family unit and stick to each other like glue while both grazing and resting. And snuggling. Amazingly, hatcheries will shove a bunch of newborn chicks in a box and send them to you via the postal service. It’s always a treat to hear the phone ring at 7AM and have the post office tell you your ‘biddies’ are in, come get them. These are 25 Cornish Cross chicks who should reach full size in 7-8 weeks. We’ll keep them under a brooder light until they get big girl feathers, then they’ll share one of our poultry tractors. The other one is currently full of turkeys. Patchwork square #5 is complete and my quilt top has, so far, cost me only $5. I’m getting them sewn by the first Tuesday of the month, so I get the following month’s fabric and pattern for free. The batiks for the pattern are all different month to month, the tan background remains the same. My quilt shop offers two color choices for the $5 quilt every year. This year it’s a blue/green batik and a red/yellow calico. 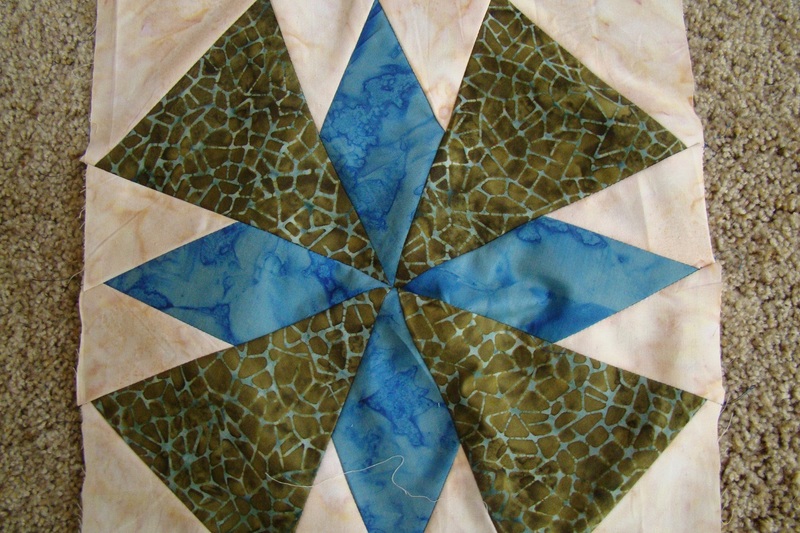 I met a quilter today at the Farmer’s Market who does them both… two of each color… for the past 5 years. Four quilts a year, I’m not that ambitious! Wikipedia states culling is the process of removing animals from a group based on specific criteria. This is done in order either to reinforce certain desirable characteristics or to remove certain undesirable characteristics from the group. Any farm with goals and standards must eventually get rid of an animal who has traits that you don’t want passed on to the next generation. You could, of course, keep said animals as pets but then you’ve got the potential to end up with your very own petting zoo that’s costly to feed and maintain. 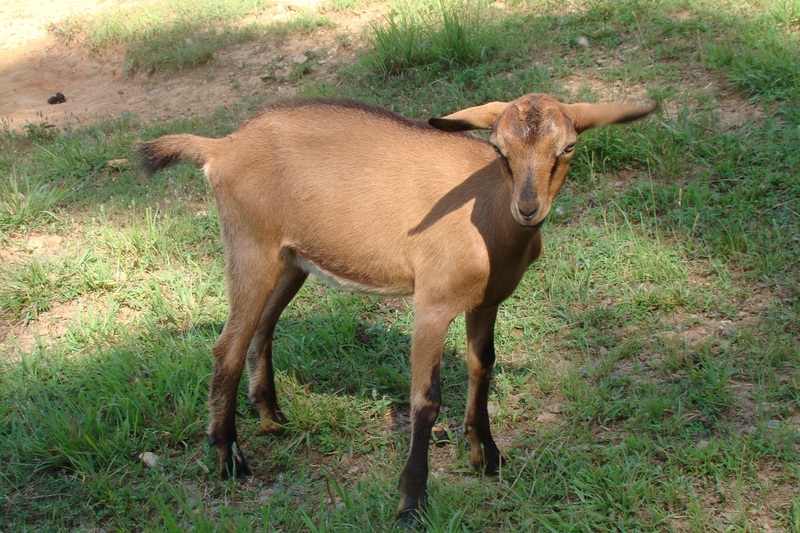 If there ever was a goat with undesirable characteristics, it’s this one. She’s one of the first ones we purchased when we started with goats three years ago. She’s got a great lineage and was expensive, and hated to be milked. Her favorite trick last year was to wait until the milk pail was full, then put her foot in it. I’m sure the neighbors think I’m a foul mouthed witch, because I would curse her loudly on a daily basis. That was last year. This year, we didn’t think she had been bred until she started showing signs of pregnancy very late in our kidding season. I guess she played hard to get. We discovered her with a little doeling in the barn, her other little girl was crying out in the pasture where she’d abandoned her. By the next morning, she had kicked them both to death. Wikipedia further states that for livestock or wildlife, the process of culling usually implies the killing of animals with undesirable characteristics. If my husband had a gun on him when he discovered those kids, he would have put her down. Instead, while he was burying them, I was driving her to the livestock auction. She could be providing someone with goat hoof flavored milk somewhere, or she could be in someone’s freezer. One farm’s cull may end up being another’s pride and joy… or dinner?